An active temple with a potent history, Wat Na Phra Men was built some time around the turn of the 16th century across the Lopburi River (now the Mueang Canal) from the north side of the island. It’s worth the side trip to see a rare early Ayutthaya-style temple that was preserved when most of the others fell. During the siege of Ayutthaya in the 1760s, the Burmese found Wat Na Phra Men to be an ideal location for bombarding the nearby Royal Palace with cannon fire. A Burmese commander was mortally injured when a cannon misfired, an incident that Thais have interpreted to add spiritual potency to the site. While a brick chedi out front looks like any other Ayutthaya ruin, the eye-catching ordination has remained pristine through the centuries. The front of the gabled roof features a particularly stunning depiction of the Hindu human-bird Garuda stretching its wings atop Kali while supporting a slender-looking Vishnu. Inside, eight massive pillars rise near a six-metre-high seated Buddha image, known for its distinctive headdress and other regalia. Displaying a level of detail rarely seen on such a large image, it’s an exquisite example of Ayutthaya-era bronze work. Elsewhere in the complex is a small wihaan housing an ancient Buddha image carved from black stone in the European posture -- seated in a chair with hands on the knees and both feet planted on the ground rather than with the usual crossed legs. It appears to display Dvaravati artistic influence and is highly unusual as Buddha images go. 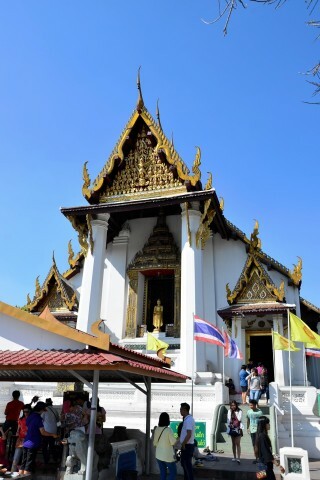 Wat Na Phra Men receives few foreign visitors but is often crowded with merit-making Thais. It’s a highly revered temple -- proper dress is essential. From here you could continue west to Wat Choeng Tha and Chedi Phu Khao Thong. Wat Na Phra Men is located just north of the island, on the north side of the Mueang Canal, and can be reached either by a footbridge to the west or a vehicular bridge to the right off Uthong Road, near Wat Thammasikarat.